The lights that are more bulky and heavy in weight are not that much powerful than the ones which comes in very elegant and sleek designs. One example of such kind of lights are the LED wall pack lights that are much better than the normal lights and have the ability to deliver more lumen output results as well. You can use an 80w LED wall pack lights to enjoy amazing outdoor ambience. •The lumen output of these 80w LED wall pack lights is almost 11,000 and it is a perfect replacement to a 250 MH lights with making a saving of 170 watts of energy. 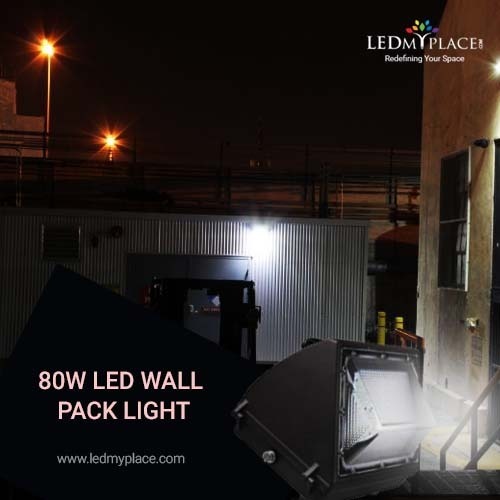 •With the additional photocell feature, you can enjoy more electricity savings; the color temperature of this wall pack light is 5700K makes that make it perfect for the outdoor security lighting purposes. •These rotatable fixture of the 80w LED wall pack lights have the beam angle of 60 degrees or more that can lighten wider areas; also the IP65 rating make them perfect for the harsh and challenging weather situation as well. •All the wall pack lights manufactured by LEDMyPlace come with 5 years of warranty. So next time don’t use the heavy lights assuming that they will brighter the environment in a better way, in fact they are just draining your hard earned money only.